Vadehra Art Gallery announces its upcoming exhibition Horses in the Air, a group exhibition with works of nine artists. The title of the exhibition references the iconic work of Eadweard Muybridge, an English photographer. Known for his pioneering work in photographic studies of motion, Muyrbidge refined his methods of instantaneous photography which he then used to photograph a horse in motion using a battery of cameras with tripwires, each of which triggered a picture for a split second as the horse ran past, their shutters set off by the animal’s movement over the wires arranged in its path. A technical and a conceptual breakthrough, the resulting series of stop-motion images proved that all of a racehorse’s hooves were, in fact, off the ground simultaneously at some point in the course of its run. This 19th century study of equine locomotion demonstrated that the human eye, otherwise unsuited to notice the details of fast motion, was now enabled by technology to decipher the most minute details by freezing moments on matter. Taking off from this cue, the exhibition focuses, through the works, on technology as it has mutated over time and the effect such mutations have had on the image. The works of the aforementioned artists inquire into the immersive quality of cinema and the philosophy of seeing, as cinema and art history come to inform and borrow from each other in terms of iconography and artistic tropes, in the attempt to create inventive visual data that complement their vision for such an amalgamation. The exhibition is directed at testing the viewer’s responses to the artwork concerned as it is mediated by a technologically-saturated habitus. 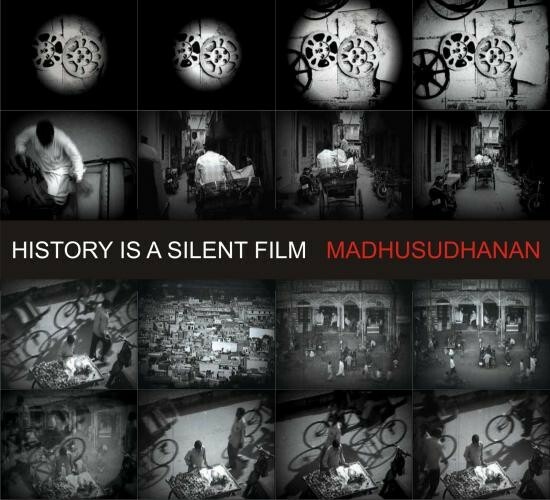 Both Nalini Malani and Madhusudhanan look at cinema and the image in relation to history and memory. Cinema is compared to the long view of history; the official versions of events are measured against the erasure and violence implicit in such selective archival. The apparatus of the camera itself is often placed in the centre of the frame – in Nalini’s case, it is flanked by the poetry of figures from different historical moments, the 3rd BC Sumerian king, Gilgamesh and the Kashmiri poet, Agha Shahid Ali (1949-2001), who ask to consider the repercussions of repression and violence that seem to be playing out in the contemporary moment constantly in different avatars. In Madhusudhanan’s paintings, it looks closer home at the genesis of cinema and art in India through an artist-figure like Raja Ravi Varma whose artistic oeuvre went on to underpin the visual consciousness of the modern nation. In the case of Atul Dodiya and Shilpa Gupta, the cinematic image and its photographic references work like signifiers in constant circulation. Their inherent instability and endless meaning-generating possibilities are explored as the images slip from one context to another and from one usage to another. For Dodiya, the aim is to explore questions of legibility around images- questions around who reads what and what kind of readings are made possible in the light of these new juxtapositions, his aesthetic drawing from and referencing dated monochromatic cinematic stills. Gupta remains more interested in the ubiquity and indispensible nature of the technological web. She looks back, through her work, at the genesis of the computer age when new artistic styles had begun to emerge as an offshoot of the internet boom. NS Harsha works with an eclectic set of references that range from traditional Indian painting traditions, minimalism, and Japanese manga. 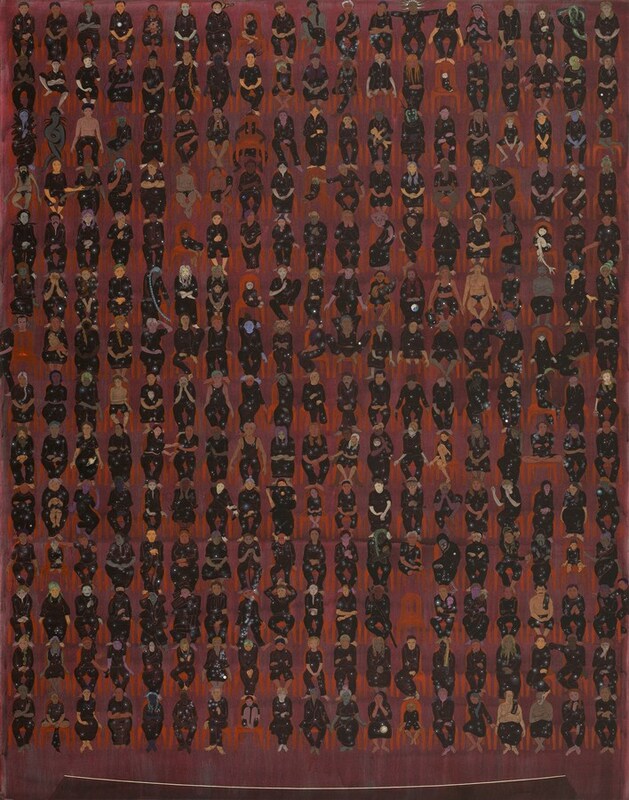 Formally playful, the delicate intensity of his work offers a subtle, satirical commentary on the world around us, as multiple sets of bodies positioned in an array of poses in the painting set the stage for different levels of reception on the viewer’s end. Riyas Komu’s oil portraits induce a similar reflection, as they have nameless faces staring directly back at the viewer, the intensity of the defiant gaze amplified by the threat of their depersonalization. The images, based on photographic references extracted from the visual barrage of mass media, are transformed into paintings, which, in their photographic verisimilitude, challenge the short-lived nature of public memory through their invasive presence. 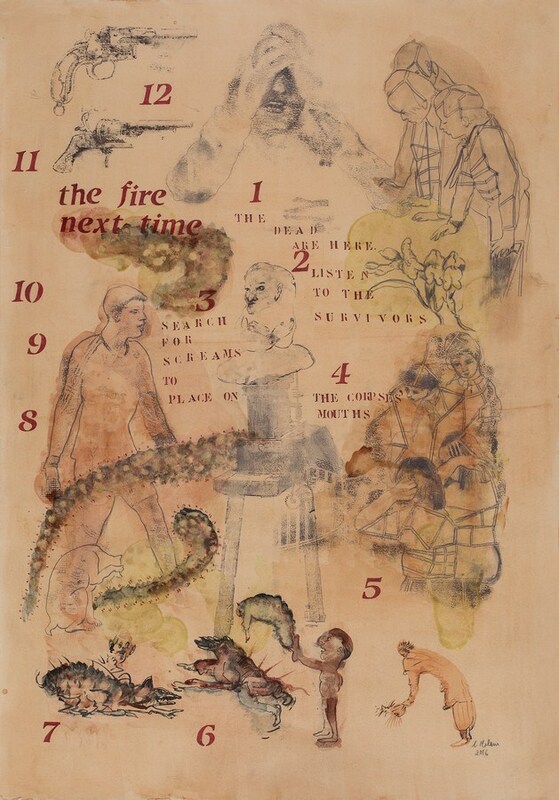 Babu Eshwar Prasad’s works are about an ongoing dialogue between cinema and visual art. Building further on his experiments with cinema via Gaalibeeja (Wind Seed), a road movie that he made in 2015, Prasad brings a soundscape together with a set of corresponding images. Working in a zone of ambiguity, the work (a meta-fiction where things speak about things about things) intends to create an immersive experience of being in a landscape and locating one’s self in it. The urban topography also takes prominence in the exhibition through intense structural investigation in Gigi Scaria’s works. Economic migrancy and dispossession mark his work, wherein form is divorced from function in the navigation of the themes of mobility and displacement that plague the space of the city. Rejecting any compositional stability, Scaria’s muted colour palettes go on to produce oneiric dreamscapes that come across as projections around urban anxieties about class mobility. The city is also explored through a different set of lenses as Jitish Kallat explores the essence of the everyday through a lenticular work. A panel of photographic prints that enable multiple (and the illusion of three-dimensional) perspectives to a single image when viewed from different angles, the work is characterized by repetition and recursion. Kallat’s work positions the city against notions of temporal continuity and overlap, its horizontal sprawl further attesting to the formal delight taken in the breakdown of any shared legibility.